You experienced some flooding and your carpets are wet so you the next step seems to be logical – call in your local carpet cleaner. In the case of water damage, what you don’t know really can hurt you. Carpet cleaners are great for general cleaning, spot cleaning and getting your home ready for the holidays but if you’re dealing with flooding or any kind of leaking and water damage, you need to call in water damage restoration experts. Professionals who deal with water damage know what problems to look for and know how to mitigate and prevent further damage. They’ll also be able to address your entire structure, not just your carpet. 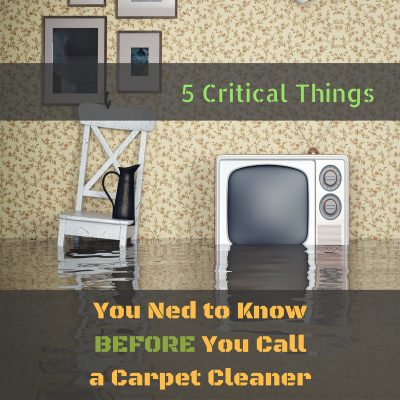 Be sure you’re aware of the often over-looked problems that happen with flooding, water damage and carpets. Wet carpets and the padding will soak up a great deal of moisture which often masks the extent of real damage. Wet carpets and padding hold the moisture which can quickly lead to damage to the subfloor. Dry wall wicks moisture up your walls and if it’s just a ¼” that moisture is usually hidden by your molding. Wet subflooring can lead to leaks into a basement, crawl space or lower levels increasing the initial damage. Wet carpets, wet subflooring, wet drywall means electrical outlets can be exposed to water. What may appear like “just a little water” may really be significant water damage. If left unaddressed, it can lead to even more damage than the initial leak or flooding caused. Even if you have hardwood or laminate flooring water will soak in between the pad and the flooring itself, giving the illusion that there isn’t much water. Excess moisture will deteriorate flooring materials and can lead to mold. These are the things that even a professional carpet cleaner will not be able to address for you. If you have any type of water in your home or business, call professional restoration experts. Professional restoration experts will be able to assess the total damage, will work with your insurance, and they will know all the necessary steps to take in order to dry out your flooring, drywall and your carpet.